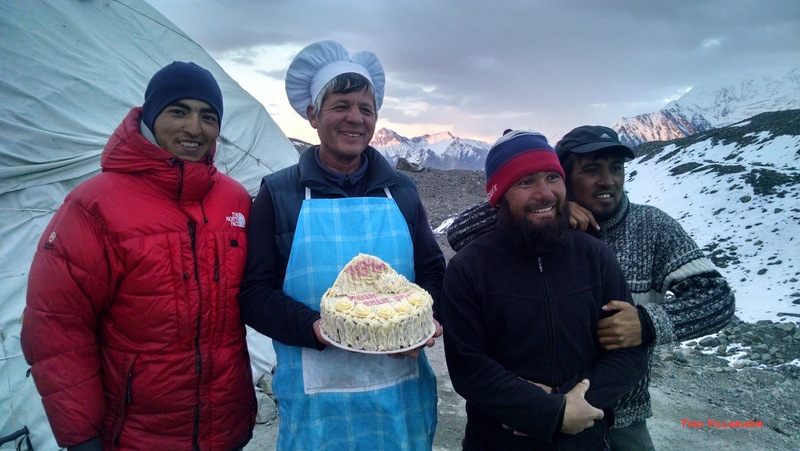 I had the opportunity to lead a Mountain Madness expedition last August, as we staged our second trip to Pik Lenin, in the Pamir Range of Kyrgyzstan. Where exactly is that, you ask? Well, that's the first thing you will notice when going to a place like Kyrgyzstan; nobody knows where it is. Heck, I didn't know exactly where it was before doing the research prior to my first trip over there. Kyrgyzstan is situated in a mountain rich zone with the Pamir Mountains, known as "the Roof of the World," forming a junction between the Himalaya and Karakoram with the Tian Shan. Sharing borders with Tajikistan, Kazakstan, Uzbekistan and Xinjiang (China), Kyrgyzstan is truly an untamed land and tends not to be a very popular place to visit - especially given it's location in the "-stans." Pakistan and Afghanistan are only one country away and I think many people assume it is a dangerous place to travel. 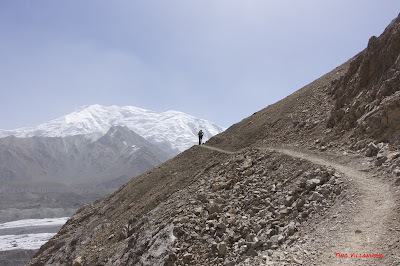 However, I have always found Kyrgyzstan safe, yet wild and a starkly beautiful place to explore. We had small team this year, only 2 climbers and 2 guides. This is not out of the normal for Mountain Madness trips, however. We tend to cater to smaller groups and it makes a huge difference in the way long expeditions play out. Luckily for us, not only was our group compact and more easily able to move per our own aspirations and health, but our team members were very strong. 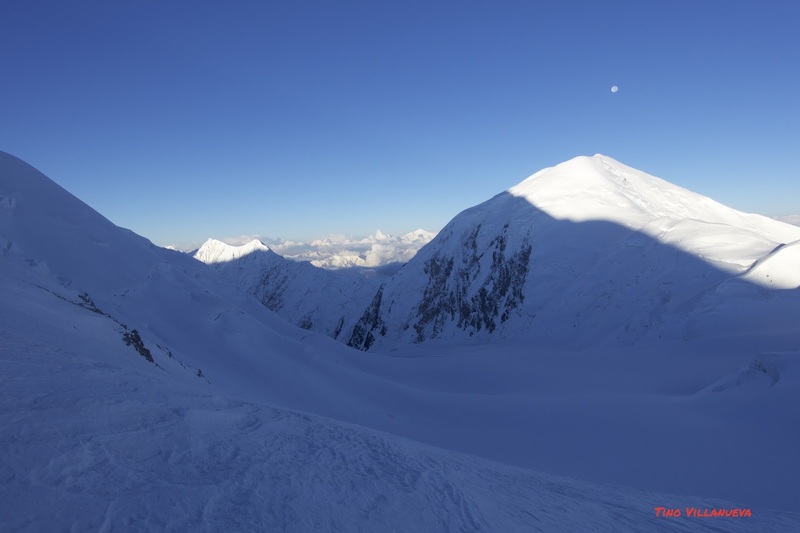 In working around weather early in the trip, we climbed strong for an entire week (reaching 5800m) before taking our first rest days, well earned and needed, as daily snow storms embattled Pik Lenin. Waiting out the storms at Advanced Base Camp was an exercise in patience, but the staff there took great care of us, feeding us excellent food for each meal. The cooks at ABC were amazing, with some of the most impressive pastry skills I have seen (especially being at 14,000 ft). Three lazy days passed before the forecast looked favorable and we packed up in preparation for our summit attempt. 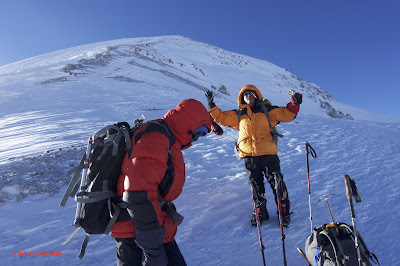 Unfortunately, in beginning the summit push, the weather was uncooperative. 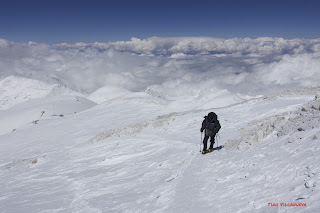 The climb to Camp 2, as with each coming day, began calm and clear, but by the afternoon clouds rolled in, snow started falling and the wind cranked up. We spent 2 windy nights at Camp 2, nylon fabric blowing into our faces, the tents collapsing, temporarily, with each blast of wind. We had planned for 1 night there. 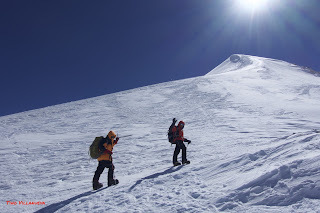 Day 3 of the summit push allowed us enough of a break in the wind to move to high camp at just over 20,000 ft. 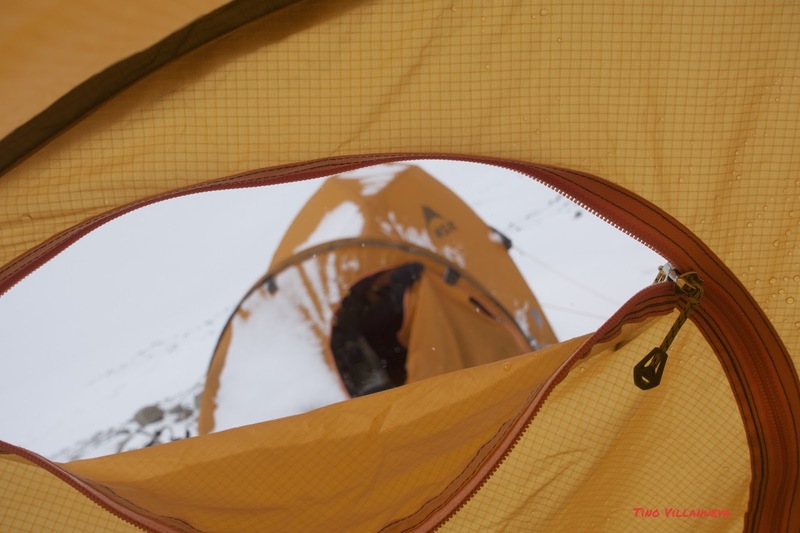 Upon arriving at Camp 3, it was very cold, windy and whiteout. We immediately jumped into a tent that had been abandoned by a retreating group in their haste to get down the mountain. After brewing up and warming up, we set up our tents and settled in for another long night. And then, another unplanned day waiting out poor weather. Finally, the summit window arrived. It was not perfect - very cold, still windy and building clouds through the day added to the pressure to get up and down this thing - far from what the weather forecasts were telling us. The morning was clear and crisp enough to see into Tajikistan and the Snow Leopard Peaks in that country: Pik Communism and Korzhenevskaya. Slowly, slowly we trudged on while watching the sky. 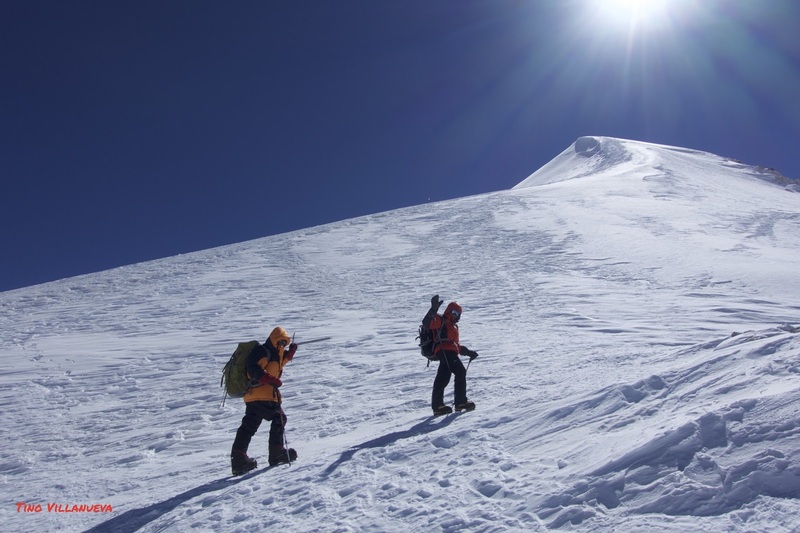 Nine hours after leaving C3, we stood at 7134m, having climbed the first of five 7000m Snow Leopard Peaks. It was certainly a struggle at times, but this expedition was one of the best I have had the pleasure of leading. In the true spirit of Mountain Madness, this expedition is exemplary of adventure travel - a big mountain expedition to a wild place which no one has ever heard of. 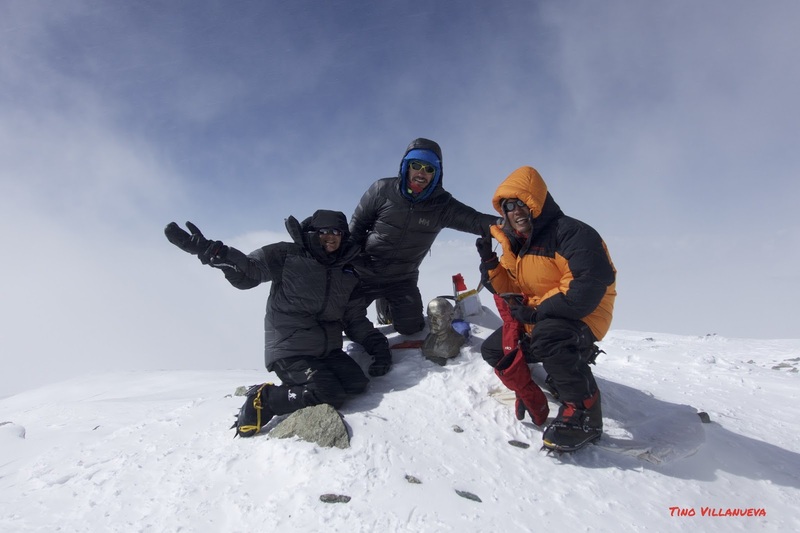 I would like to congratulate our climbers, Bridget and Chok, and thank them for the great experiences we shared on that mountain. There are so many things to do and see in this world. 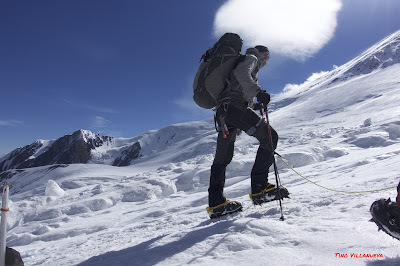 But, I think if you ask Bridget and Chok, this type of climbing - into the wild unknowns - is challenging, rewarding and adventurous; it is what we are looking for.